Zexum AC-DC 600mA Adaptor with adjustable Output Voltage (3V, 4.5V, 5V, 6V, 7.5V, 9V, 12V) is ideal for use with Radios, CD Players, Calculators, Hand Held Games, Toys and Radio Toys along with a variety of other applications. Has the flexibility to charge a multitude of appliances through its choice of connectors and voltage settings. Input: 100-240V AC~60/50Hz 85mA. - Note: Requires up to 300mA of input power. 7 Voltage Options - 3/4.5/5/6/7.5/9/12V DC, 3.6mA Max. Current - 3/4.5/5V DC~600mA Max, 6V DC~500mA Max, 9V DC~400mA Max, 12V DC~300mA Max. 6 DC Plug Sizes, Simple interchangeable Output Connectors - 2.5mm (Male), 3.5mm (Male), 3.5 x 1.35mm (Female), 5.0 x 2.1mm (Female), 5.5 x 2.5mm (Female) and 5.5 x 1.5mm (Female). Very pleased with the product.It replaces one that I broke. Not sure if it was the post office or not but delivery slow. 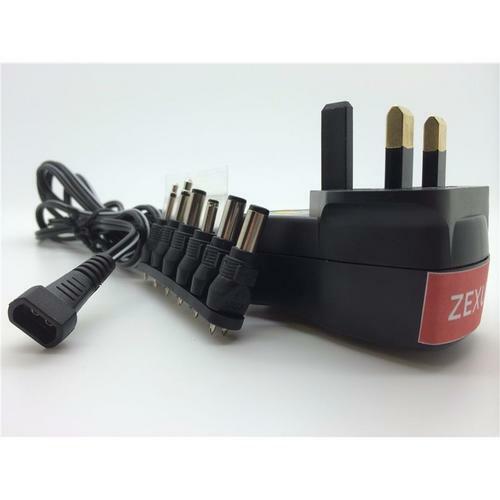 I ordered this Zexum 600mA Universal multi voltage Plug power Supply Adapter, as on the previous adaptor, of a different brand, the wire had snapped, so I could not play my portable radio anymore. This one looks sturdy, does the job perfectly, at a good price. Very happy! Hello , is there an led indicator on these to show they are on? Electrical World Replies: Thanks for the question - yes there is.